One of the hardest (and sometimes, funniest) menopause symptoms to get used to is passing gas (flatulence). It's all due to those changing hormones and sometimes takes the form of bloating and even burping. I think I'd rather do the burping, but haven't been that lucky. 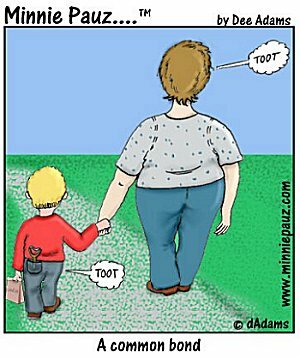 This cartoon came to be when I saw how "tooting" came so naturally to my grandchildren and I felt we had a common bond! It IS very common with most of us as we go through our changes and can be quite embarrasing, but there are ways to minimize or somewhat control when and where it happens by learning what foods give you gas and what products help relieve it.